The project is a master plan for an 880-acre property situated in between the New York City watershed and Catskill State Park. The East Delaware Aqueduct runs through the property, locating it on a line that connects the Pepacton Reservoir to Manhattan (originally to Central Park, which is 843 acres.) 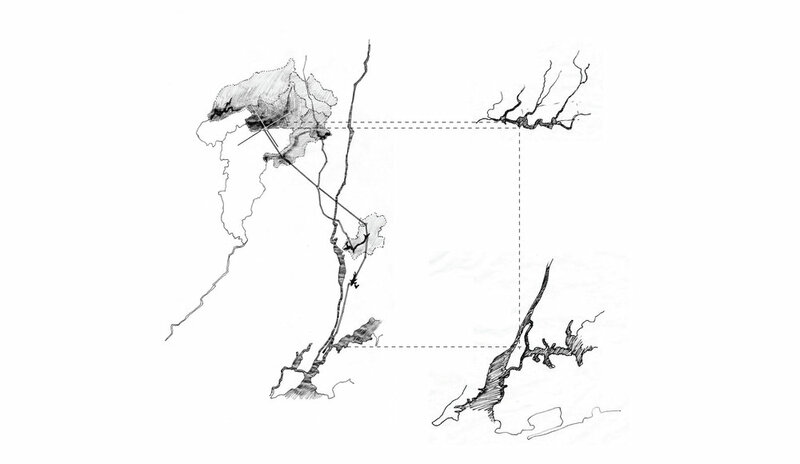 The juxtaposition of the plans of each of these reveals inverse gestalt morphologies, of land that has been shaped by water over time (island), and of water given its form by the hills around it (reservoir). This ability of water and earth to interact in the creation of form is a primary consideration for the project. Water is considered to be a sculpting element and a communicating element between moments of inhabitation. The organizational strategy for the master plan seeks to integrate: a tectonic history of the site (land forms, fault lines, the drilling of the aqueduct), a history of domestication and land use (deforestation, bluestone quarrying, farming, hotel resort), and the movement of water through and over the property (natural springs, water collection, the aqueduct). A series of ongoing analytic studies to evaluate the relationship between these elements provides the loose conceptual structure for the placement and orientation of new structures. The existing structures on site, built around 1900, facilitated a resort that served as a nature retreat for NYC residents through the 1930’s. The current program aims to revive this mission, with a renewed focus on nature observation, health and wellness, outdoor living and the creation of art. These are achieved through the sensitive renovation of existing structures, as well as the introduction of new projects such as: house for caretaker; mountain cabins; bath house; playgrounds; observatory; art studio and wood shop; sculpture pavilion; and several gardens.